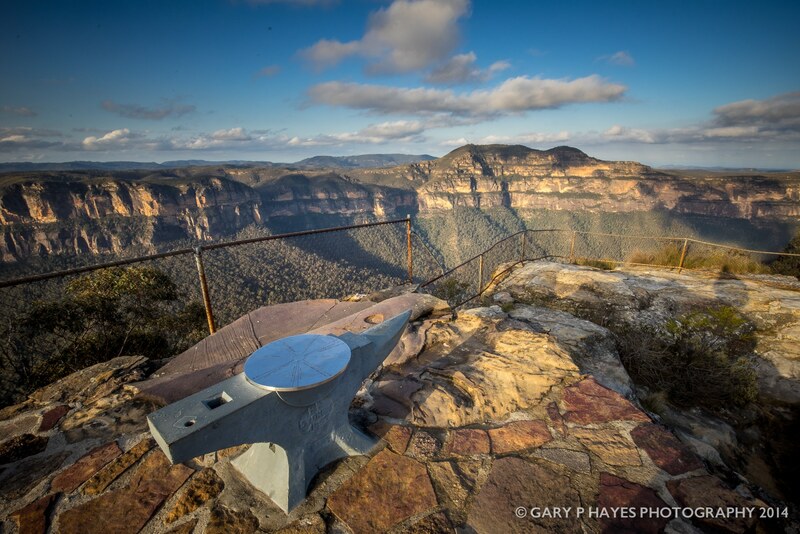 ABOUT: Anvil Rock is a fantastic viewpoint to see along the deepest section of the Grose Valley and directly opposite the face of Mount Banks and it’s 300+m drop. The valley runs below on a left to right bend and the railed platform below the actual small ‘anvil’ rock, has good step views (without much foreground sadly). Good at both sunset and sunrise due to the sun setting left and right of its NE orientation but better photogenic (with foreground) views can be had on the escarpment just off the short 5 minute walk from the car park area. PHOTO EQUIPMENT TO BRING: Moderate wide angles and some medium telephotos 105mm ish for distant views to Walls Lookout and Mount Banks cliffs of 500m height, across the valley. Consider a panorama of the northern walls of the Grose too. GETTING TO THE SPOT/S: Follow the dirt road which starts as Hat Hill Rd from Blackheath almost all the way to Perrys Lookdown, but take the obvious left turn about 500m before Perrys Lookdown – Anvil Rock and Wind Caves are about 1km further and both features are only 5mins from car park.